NASA revealed a new video game today (July 16), one that celebrates the Aug. 5 landing of its huge Curiosity rover on the surface of Mars. 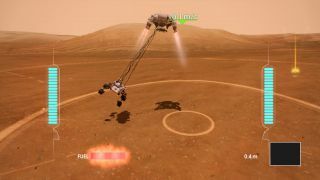 The game, called "Mars Rover Landing," is produced in collaboration with Microsoft and plays on the Xbox 360 system using the Kinect motion sensor. It's available free of charge in the Xbox Live Marketplace and Kinect Central, officials said. "Mars Rover Landing" allows players to take control of Curiosity's spacecraft as it streaks through the Red Planet's atmosphere on a harrowing journey that mission engineers have dubbed "seven minutes of terror." At the end, a rocket-powered sky crane lowers the rover to the Martian surface on cables, then flies off to crash-land intentionally a safe distance away. The game is an outreach vehicle, McCuistion added, an attempt to raise awareness of Curiosity's mission and NASA's planetary exploration endeavors in a more general sense. The 1-ton Curiosity rover is the centerpiece of NASA's $2.5 billion Mars Science Laboratory mission. It blasted off in late November and is on schedule to touch down at Mars' Gale Crater on the night of Aug. 5. Curiosity's main goal is to determine if the Gale Crater area is, or ever was, capable of supporting microbial life. The rover sports 10 difference science instruments to help it in this task, including a rock-zapping laser and gear that can detect organic compounds — the carbon-containing building blocks of life as we know it. NASA's Mars program is in flux after President Barack Obama's proposed 2013 federal budget, which was released in February, cut the agency's planetary science efforts by more than 20 percent. NASA is reformulating its Mars exploration efforts, attempting to find ways to do the best science possible with its limited means. Agency officials have said they hope Curiosity's performance excites the American public and the nation's politicians, perhaps sparking a chain of events that brings some money back to NASA's planetary science efforts in the future. NASA is working hard to get the word out about Curiosity's upcoming touchdown, and it's hosting landing parties at multiple NASA centers. The agency is also using the event as a teaching tool to engage people in science and planetary exploration. For example, NASA has produced 1,500 copies of a Mars-specific Braille book for the blind, McCuistion said. "Technology is making it possible for the public to participate in exploration as it never has before," Michelle Viotti, JPL's Mars public engagement manager, said in a statement. "Because Mars exploration is fundamentally a shared human endeavor, we want everyone around the globe to have the most immersive experience possible."